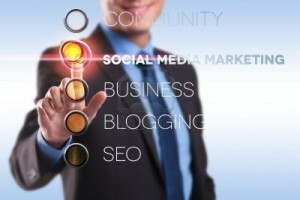 Many companies segregate their Social Media Marketing strategy from their SEO strategy. As a per a study, organizations with the most powerful SEO linked social media strategies now generate the best results and vice versa. Companies which perceive themselves as very good at in Search Engine Optimization are now integrating social media into the strategy. Businesses to Businesses (b2b) cite social media as the number two most significant factor in search ranking behind only quality content. Around 1/3rd of world-wide b2b purchasers leverage social media to engage with their vendors. Around 75% anticipate utilizing social media marketing in near future. An impressive 77% of purchasers opine that they would prefer to buy from an organization whose CEO harnesses social media. Last year as per HubSpot, 92% of marketers opined that social media marketing was critical for their business. 80% of the marketers acknowledged that social media marketing efforts led to a higher traffic to their websites. As per social media examiner, 97% of marketers are presently engaged in social media. We look at how to leverage social media marketing to boost website rankings. In order to do this, follow some high ranking blogs in the same industry as the website. Give quality and keyword rich comments concerning the blog posts. It’s advisable to give social media handles rather than giving links to the website. Connecting via social media platform is a great way to have sales conversion. The process has to be made easy in order for folk to connect with the website and build strong relationships. By following the above procedure Google will factor in social media influence and accordingly elevate the website’s page rank. The best way to obtain a high page rank is to have new engaging content on a regular basis so that search engines can pick them up. To score extra points you should release your content across all the social media platforms. Ensure to focus on utilizing keywords effectively. The latter can be done by maintaining a keyword rich title as well as description. Remember to include social media share buttons so that people can conveniently share your content and also include hyperlinks go back to your page. It’s important to craft an environment in which people can conveniently and freely converse over various social media platforms. It’s important to consider Guest Blogging Services. By letting guest bloggers publish on the website, the site can obtain a few back links by getting the guest blogger include links back to the webpage. Google search engine appreciate links. The more the number of links that are directing to back to website the more improvement in the search page ranking. The social media phenomenon is spreading fast. Leveraging this concept can go a long way in improving webpage rankings. This is the technology of the future and takes time to give results. BY giving quality content and persevering with the social media strategies, websites will experience vast improvement in the search engine rankings.